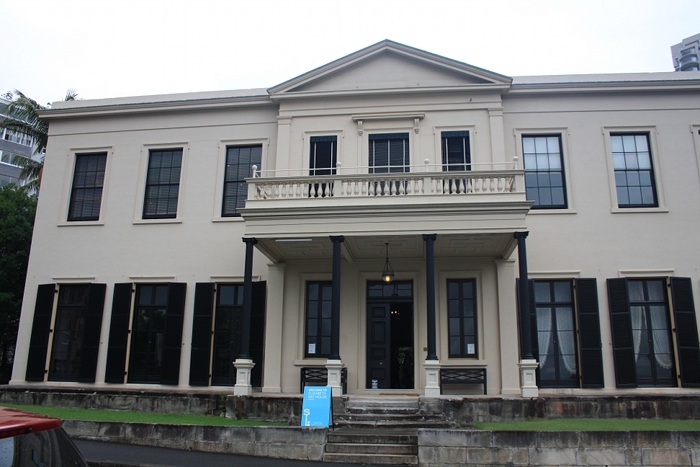 Elizabeth Bay House, built between 1835 and 1839 for Alexander Macleay and his family, was intended to be ‘the finest house in the colony’. Macleay arrived in Sydney in 1826 as Colonial Secretary of New South Wales, after the Governor the most important official position in the colony. Well educated and a highly experienced civil servant, Macleay took up the position from financial necessity. He was granted over 20 hectares of land at Elizabeth Bay, three kilometres from the city centre. Macleay had a broad range of interests including entomology (his collection of specimens was reputed to be the largest in private hands) and horticulture, which were strongly reflected in his house and garden. Architect John Verge oversaw construction, but the original source of the design is not known. The money ran out before the exterior of the house was finished and the intended colonnade was not built. The portico was added in 1893. After many changes of ownership and uses the house was restored by the State and opened as a museum in 1977. 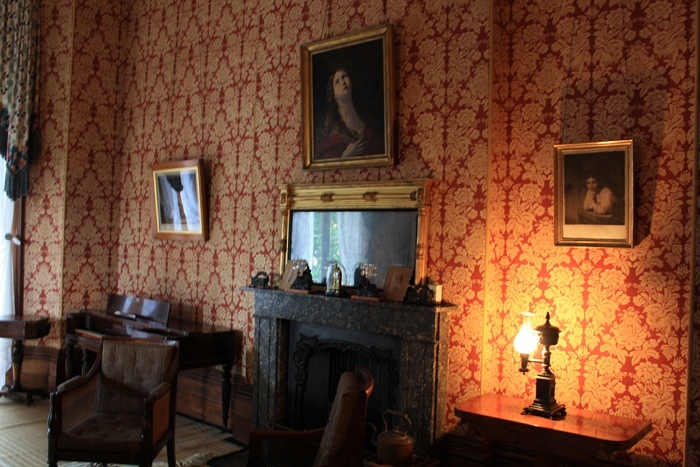 The interiors have been decorated and furnished to reflect their use by the Macleay family between 1839 and 1845. The extensive grounds were subdivided and sold over the years and are now mainly covered by apartment blocks of various ages. 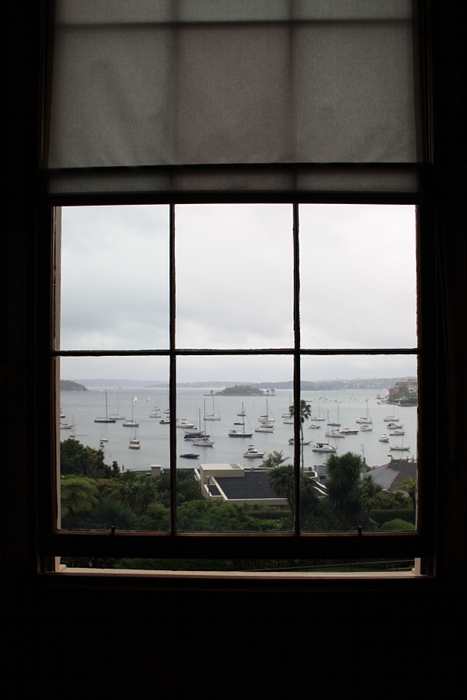 However the Council purchased the area immediately in front of the building, preserving some of the views to the harbour and maintaining some of the context of the House. Unfortunately my visit was on a very wet day and I was not able to explore the remnants of the gardens. The house was located high on the hillside, making the most of the view down the harbour. This photograph shows the outlook from the window of Alexander Macleay’s bedroom in the top right corner of the building (viewed from the street). The house is carefully oriented to the east and on the winter solstice the first light through the heads of the harbour pierces the house from front door to back. The rooms at the front of the house were bright even on a dull day. On the ground floor there are wooden internal shutters in addition to the external shutters. On the upper level the canvas blinds seem hardly adequate to the task of protection from the sun. 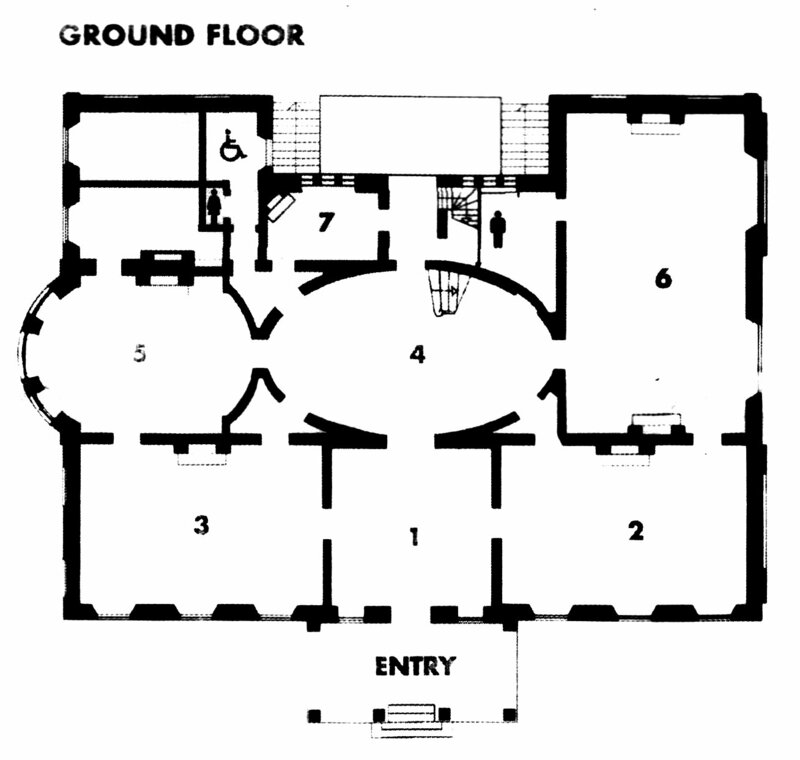 The domed saloon with lantern windows in the centre of the house (marked “4” on the plan) brings light into the interior. All the photographs in this report were taken (with permission) without flash. 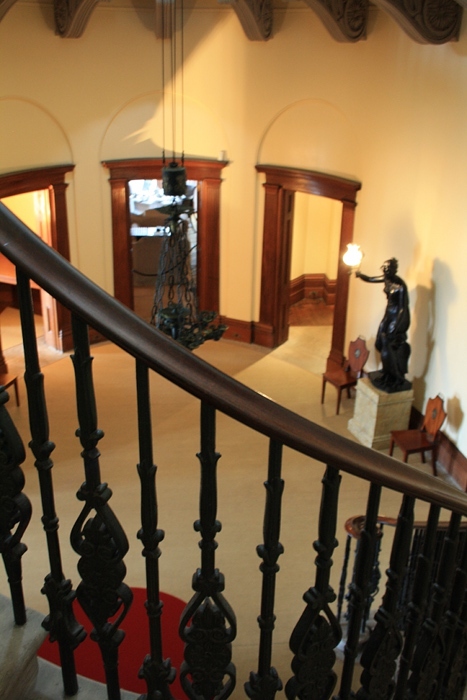 The elliptical saloon is a remarkable space, connecting all the public rooms and the main levels of the house. It displays wealth and refinement. The cantilevered staircase of Marulan mudstone leads the eye up and constantly surprises with complex forms as you move through the house. The geometry is firmly reinforced with a radiating pattern in the mudstone floor, strict symmetry in the placement of doors, including a partial false door under the stairs, and reflected in the curved cedar door to the oval breakfast room (“5” on the plan). There is limited furniture and artwork in the saloon. The architecture is the star. 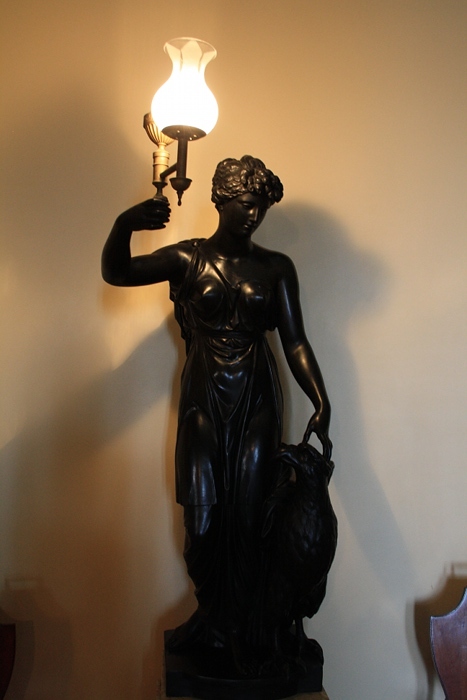 However lighting is provided by two bronzed plaster figures representing Vesta, designed by architect Thomas Hopper. The choice of a mythological subject again displays the refinement and education of the owner. 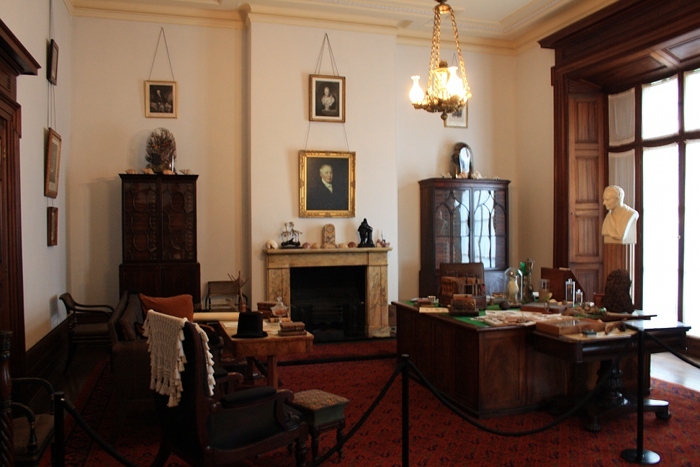 However the interests and personality of Alexander Macleay is most strongly seen in the library (room “6”), the largest room in the colony when built and intended to house his book and natural history collections. This is the comfortable room of a cultivated, wealthy, man of learning. Alexander Macleay was a member of the Linnean Society. 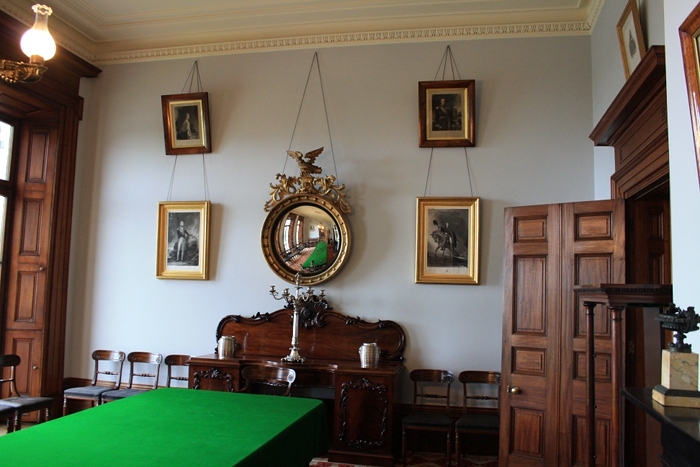 Portraits hung on the walls include Macleay himself and prominent men of science and exploration such as Cook, Banks and Linnaeus. A number of the rooms are roped off. I was very fortunate that, having asked about the selection of artwork, I was given a personal guided tour through the building including some normally restricted areas. The large desk to the right of the photograph above is a “specimen desk” which the guide opened to show the many drawers used for insect specimens. The broken pediment cabinet on the left in this photograph beautifully illustrates the combination of wealth, taste and learning being displayed by Macleay. Behind the glass doors are drawers containing part of his entomological collection. The cabinet itself is finely made and each drawer front is veneered with a different species of wood. 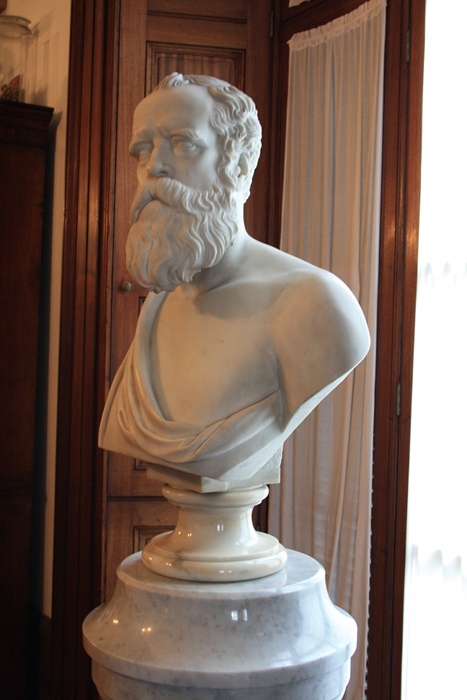 This marble bust by Achille Simonetti of Sir William John Macleay, nephew of Alexander, shows him as a Greek philosopher – a man of science and learning. Another bust in the room is of William Sharp Macleay, son of Alexander. 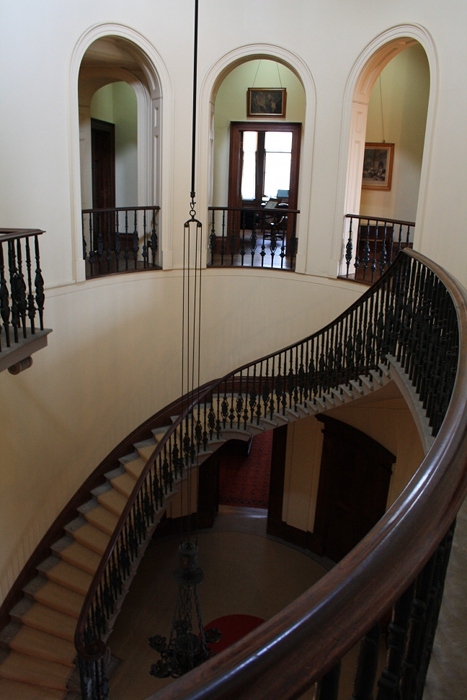 All three men lived in Elizabeth House and pursued their scientific interests there. Next to the library at the front of the house is the drawing room (“2” on the plan). This is a light and feminine space, used particularly by the ladies of the house and their guests after dinner. Rather than “serious” paintings of mythological subjects or historical figures, here we see still lifes and gentle narratives in watercolours and acquatints. This room also demonstrates the wealth and good taste of its owners. The light ground of the Brussels weave carpet would be expensive to maintain, the white marble chimneypiece was imported from London. 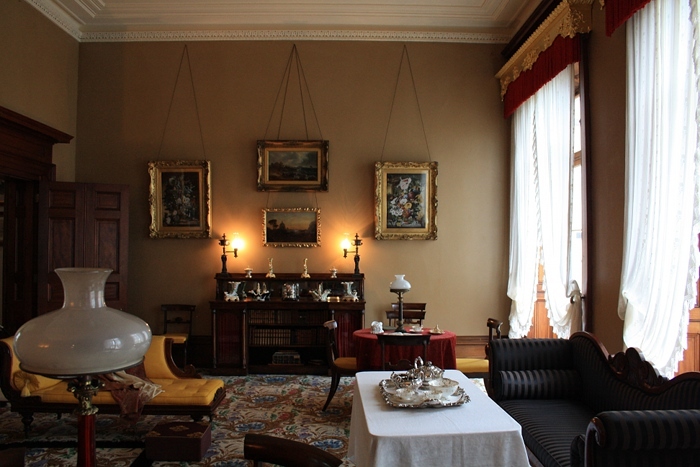 The light fixture seen in the photograph is obviously modern, but one can also see the pier glass with its gilt frame over the mantlepiece and the lustre lamps, all intended to reflect light around the room. Some of the Macleay daughters were quite accomplished painters. 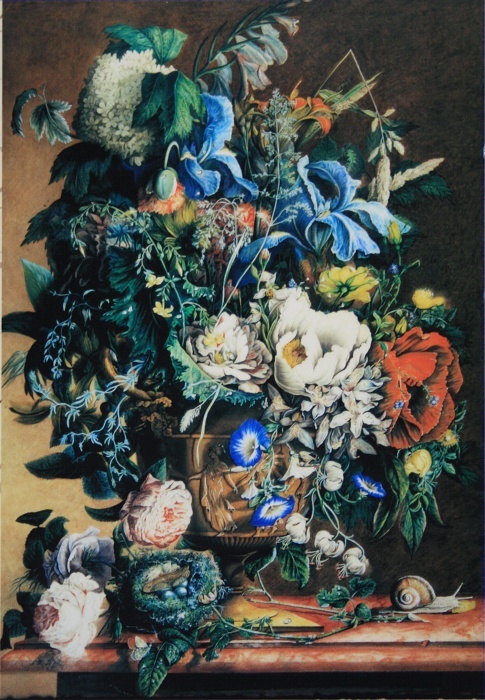 On the left is a still life watercolour by Frances ‘Fanny’ Macleay, which was exhibited by her as an honorary exhibitor at the Royal Academy London in 1824. 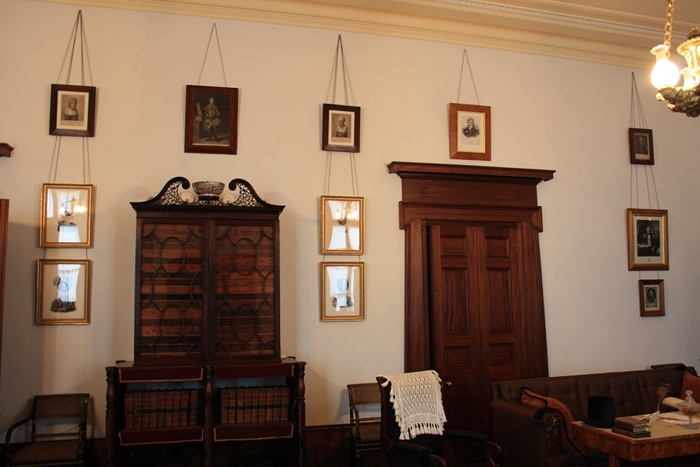 Hung in the home such works would demonstrate the girls’ accomplishment, refinement and education. A reproduction of this work hangs in the drawing room today. The dining room (“3” on the plan) while a shared space is more masculine given the gentlemen would have remained there after dinner to discuss politics, science etc. The mantlepiece is black french slate. The curators have chosen a Napoleonic theme with etchings of Nelson, Wellington, Pitt the younger and Napoleon. 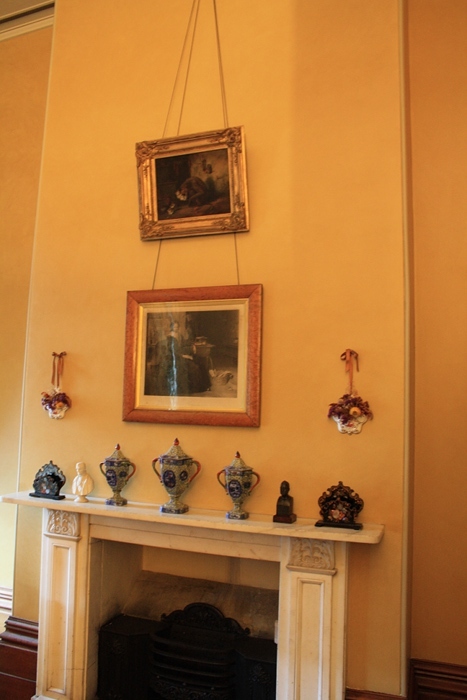 There are also etchings of the young Victoria and Albert, as well as a coronation scene above the mantlepiece. There is documentation that Macleay owned portraits of Louis XIV and King Charles I, possibly displayed to suggest his conservative politics and monarchist sentiments. 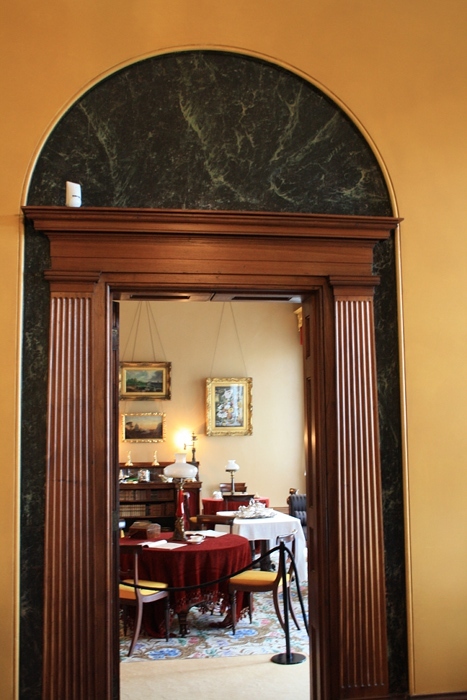 The breakfast room (“5” on the plan) is unusual in being quite oval, including the curved door leading to the saloon. It is also dark, a result of the wallpaper (based on fragments found during restoration) and the southerly orientation. This would be more private than the other rooms on the ground floor, and again a more feminine space. 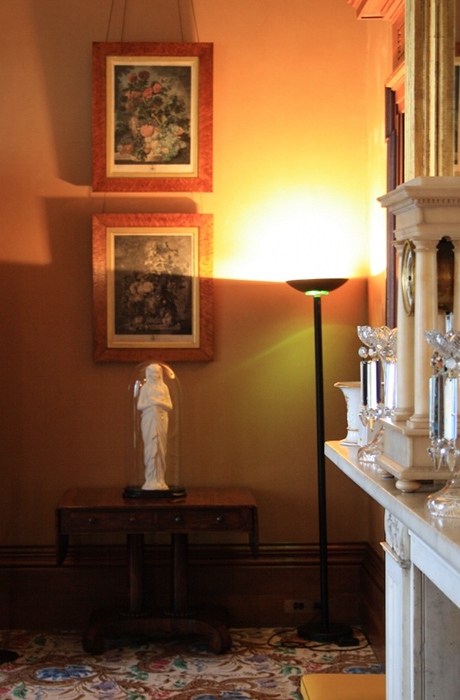 The painting above the mantlepiece is a copy by one of the Macleay daughters of a Penitent Magdalene. It is perhaps advanced for a young lady of the time, being in oil paint, but there is awkwardness particularly around the neck. 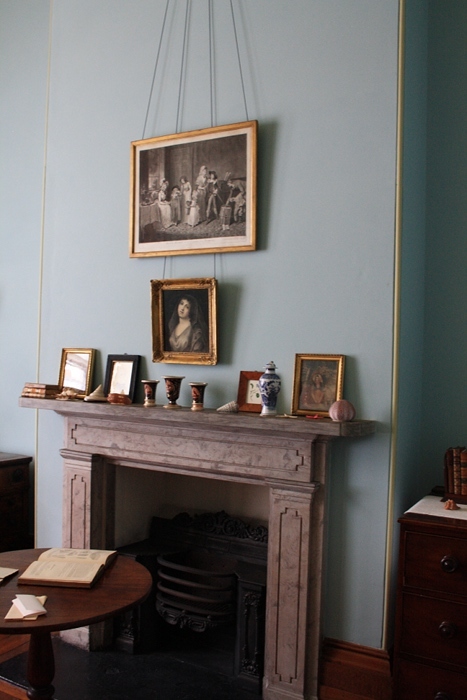 The other artwork in the room consists of etchings and acquatints, mainly either young wistful women or interior views of families at their morning and evening devotions and other tales of morality. Upstairs there were six bedrooms for family members. There were some small bedrooms for servants in the attic and at the rear of the building, but most were accommodated in the separate two-story kitchen wing, since demolished. 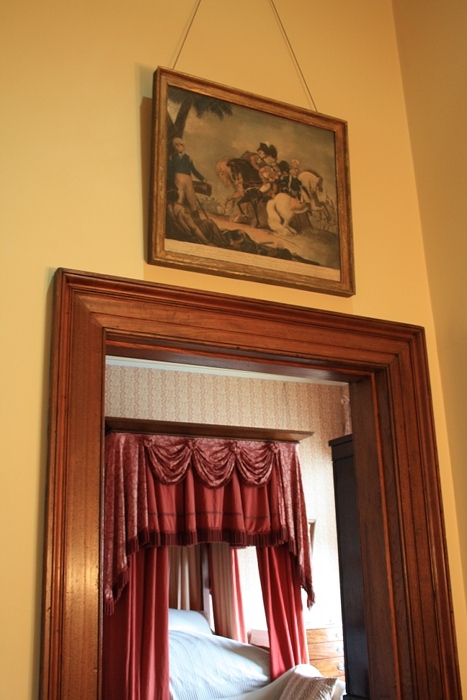 The room shown here has been furnished as the room of Kennethina Macleay, the only unmarried daughter of the family. The prints here are similar to those in the breakfast room downstairs, illustrating young women, morality tales, and a gentle landscape. More prints have been hung in the curved hall outside the bedrooms, such as Watt’s etching of Landseer’s The Highland Drover’s Departing for the South. Above Kennethina’s door it seemed to be a sweet family in an interior. The selection above Alexander and Eliza’s room was a more active scene (Eliza bore 17 children in all, of whom 10 survived infancy). Also on the first floor is the morning room, generally seen as a private sitting room particularly for the women of the family. It has the same mix of gentle prints (the top one here appears to be a monkey playing with kittens) and bric-a-brac. It is also furnished with musical instruments, reading and sewing tables, writing desk and a telescope trained down the harbour. Interestingly the guide explained that this was thought to be a semi-pubic room based on general standard of finish and the height of the wainscot (what I would call skirting board). This was highest in public rooms, less in family bedrooms and smallest of all in the maid’s bedroom. Presumably if other Sydney ladies paid a call they may have joined the family here. 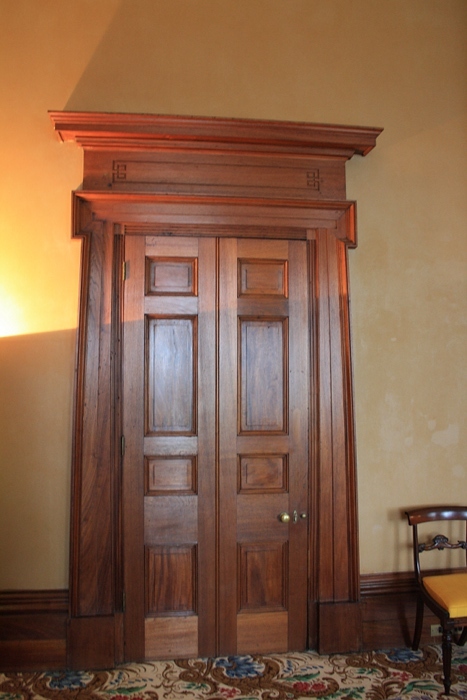 This photograph of a door in the drawing room gives a better idea of the paneling and of the flared Greek doric column detailing of the doorways. This is consistent with the overall Greek revival architecture of the house. This was already rather old-fashioned at the time the house was built, but Alexander Macleay was in his mid-sixties and presumably chose what was familiar and comfortable to him. This final view is from the square entry hall, showing the original marbled paint finish surrounding the door with plaster finish, and overall paint colour based on wall scrapings, looking into the drawing room with its expensive and tasteful furnishings and artwork. This was a house built and furnished to impress visitors, a showpiece. It was also a home built to accommodate a large family and their myriad interests. More information about the house can be found at http://www.hht.net.au/discover/highlights/guidebooks/elizabeth_bay_house_guidebook and the garden at http://www.hht.net.au/discover/highlights/articles/the_grotto_and_the_garden_of_elizabeth_bay_house. The course notes request a painting by Seurat, van Gogh or Gauguin. The Art Gallery of NSW has an early van Gogh, so I have selected that for my focus. This is quite a dark picture, so click on the link to the Gallery site for a better image. The painting is around about life size and feels warm and intimate. I get a real sense of an individual, a particular person with his own story. He’s looking down, perhaps weary or lost in thought, but I think I can see smile lines around the eyes – life may have been a struggle but he has had times of pleasure. The clothing may be rough, dark and drab, but also warm and comfortable. The picture’s colouring is based on the red / green complements, generally dark, muddy and subdued. The face is lit from the left side, while the lighter background on the right allows us to see the shape of the face and body on that side. Every line of the painting seems to be an angle, and the paint itself often leaves a thick raised line. I get a sense of the energy and commitment of the artist, loading up his brush, pushing and dragging the pigment around the canvas. With those lines and angles there is no softening, no sentimentality about the hard life of the man portrayed. 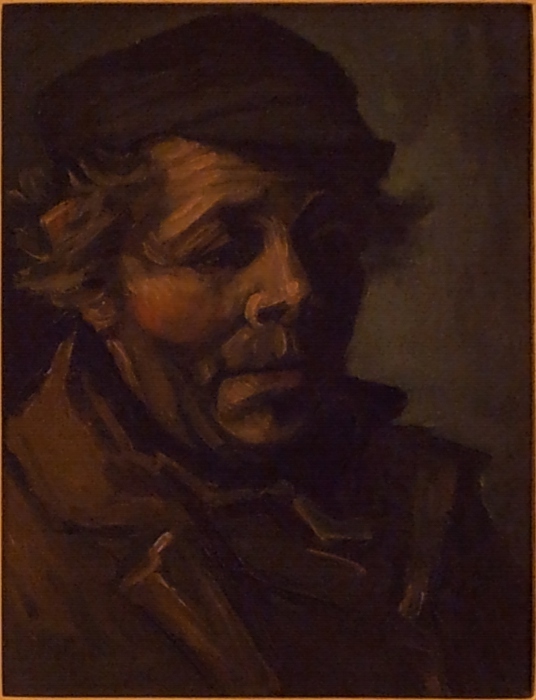 This portrait was one of a “Heads of the People” series van Gogh worked on early in his artistic career while living Nuenen, a rural area in the Netherlands. Van Gogh wanted to make many such studies – fifty or more – and despite my initial comments above about the individual further reading has shown that he desired to find “the type distilled from many individuals” (1). Art could show something with soul, something more than any one individual. “I don’t yet know what I shall do with those heads, but I want to extract the motif from the characters themselves”(2) wrote van Gogh in December 1884. Just a few months later, in April 1885, he had almost finished his painting The Potato Eaters which is now in the van Gogh museum in Amsterdam. The web image in the Google Art Project has better detail than the museum website – see www.google.com/culturalinstitute/asset-viewer/the-potato-eaters/7gFcKarE9QeaXw?projectId=art-project. It seems one of the heads is very closely based on the study which is my focus picture, although here connecting with his gaze to another figure. Not wanting to turn this post into a marathon, I’ll just link to a couple of van Gogh’s letters which I found interesting particularly in respect to colour. Writing to Theo on 30 April 1885 (see vangoghletters.org/vg/letters/let497/letter.html) van Gogh talks about how far he has moved with colour, and goes into considerable depth on colour use by weavers. He’s also concerned about the framing of the picture, wanting it surrounded by gold or else on a wall “a deep tone of ripe wheat”. Apart from the colour interaction he wanted, that reference to wheat seems symbolic. In a similar vein, van Gogh notes the “rough and coarse look” of the painting, not at all the “conventional smoothness” which he believes would be wrong for this subject. In another letter just days later (see vangoghletters.org/vg/letters/let499/letter.html) there is a lot more about colour, and a phrase that I’ve seen quoted repeatedly about the colour of the heads “something like the colour of a really dusty potato, unpeeled of course” plus quoting Senier about Millet’s painting “his peasants seem to have been painted with the soil they sow”. Colour and interactions of colour are vitally important, but the literal accuracy of the seen colour is not. Colour, texture and line are used to carry and deepen the meaning of the picture. The course notes ask about “Post-Impressionism” – its very name defined by what was happening before. Was it a significant movement in its own right, a stepping stone to Cubism and Expressionism, just “different stuff that happened after Impressionism”…? The name itself was coined by Roger Fry in a show he organised in 1910 in London, “Manet And The Post Impressionists”, which included the work of Seurat, Van Gogh, Gaugin and Cézanne. Together with a second exhibition two years later, Second Post-Impressionist Exhibition, the exhibitions are seen as highly significant to British artists (see www2.tate.org.uk/archivejourneys/bloomsburyhtml/bio_fry_modernart.htm). It continues to be a useful concept, for example appearing on the Heilbrunn Timeline of Art History at the Metropolitan Museum of Art (see www.metmuseum.org/toah/hd/poim/hd_poim.htm). However while all seeking something more, something new, something authentic to themselves, the artists grouped under “Post-Impressionism” were following quite different lines of inquiry. It’s not a term or a grouping they would have recognised – the main figures were all dead by the time of the exhibitions. In fact I wonder if their rather short painting careers, especially compared with some of the giants of Impressionism and later – Monet, Matisse, Picasso, Braque – could be a factor. If each of the Post-Impressionists had been able to develop their ideas further, would it still be possible to lump them together? – quite possibly “Yes”, when you consider the range of artists regarded as “Impressionists”. However based on the reading I’ve done on van Gogh, he is most definitely “After-Impressionist”. He was highly aware of the work of artists before him, and of those working at the same time. He drove himself to build skills, to experiment, to find a way to achieve the paintings that were in his head. He consciously used the previous work of those he admired – for example Millet’s Man with a Hoe – combining it with his own experiments with colour and line. Van Gogh’s very deliberate use of line and colour to represent his ideas about his subjects, not their physical appearance, seems to me something quite new at the time. I’ve just come back from a few days in Canberra, looking mainly at the work of abstract expressionists as preparation for the next assignment. In a room with work by de Kooning and Pollock I thought I could see some echoes of van Gogh. * A talk by Judy Sund of the Graduate Center of the City University of New York: Van Gogh’s Peasants: The Essence of Earthiness Van Gogh’s portraits of Patience Escalier, is available at http://vimeo.com/72295421. My focus picture and of course Potato Eaters are included in her discussion of the later work. I found this quite late in my research and there’s a lot of overlap in material. Sund’s inclusion of literary and musical links is very interesting. * In my research I found different accounts of van Gogh’s perceptions of peasants. He was interested in having his work reproduced, so that even the poorest could have art on their walls. In 1882 he wrote to his brother Theo “I believe that if one wants to make figures, one must have a warm feeling, what Punch calls in its Christmas picture, Good will to all – that means one must have real love for one’s fellow creatures. I for one hope to try my best to be in such a mood as much as possible.” (4) In 1885: “No — one must paint the peasants as if one were one of them, as feeling, thinking as they do themselves. As not being able to be other than one is. I so often think that the peasants are a world in themselves, so much better in many respects than the civilized world. Not in all respects, because what do they know of art and many other things?” (5), and in 1888 “an unspoiled creature with the instincts of a wild beast” (6). In her talk Judy Sund provides a number of quotes where van Gogh seems to see peasants as dangerous, brutal beasts. It makes me question my initial description of the painting – is there really the warmth and affection that I see? * An article in Nature shows a newly discovered van Gogh painting – found underneath an unrelated landscape. 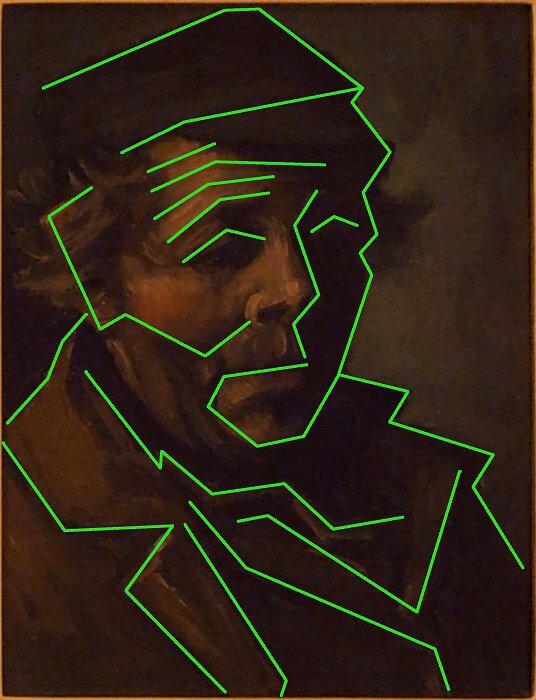 It seems clearly to be one of his Nuenen peasants, and I was surprised to see the level of detail including partial colour obtained using a Synchrotron X-ray and known metallic components of pigments used by van Gogh. See Ball, P 2008, ‘The hidden van Gogh’, Nature, 454, 7204, p. 563, Academic Search Alumni Edition, EBSCOhost, viewed 23 November 2013. (1) vangoghletters.org/vg/letters/let298/letter.html Letter from Vincent van Gogh to Theo van Gogh. The Hague, 3 January 1883. The focus of this research point is Seurat’s painting techniques and any link they have to his working-class subject matter. Seurat’s techniques were based on emerging science of the time, proceeding in a very logical and disciplined way. In an effort to bring greater luminosity and vibrancy into his paintings he used pure colours on his canvas. Rather than mixing on the palette, he placed small strokes or dots of colour next to each other, intending for the colours to mix optically in the eyes of the viewer. I’ve seen the technique termed “pointillism”, “divisionism” and “chromo-luminarism” (although I think more precisely “pointillism” refers to painting in small dots, while “divisionism” is keeping colours separate). 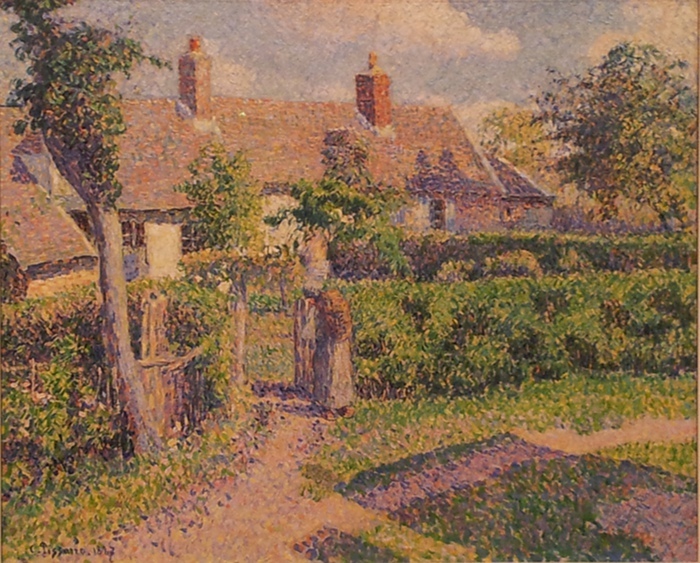 Here is an example by Camille Pissarro, who used Seurat’s technique for a time (the Art Gallery of NSW doesn’t have a Seurat). As always I encourage anyone reading to follow the link to the Gallery website, which has clearer photos and show the bright colours used. 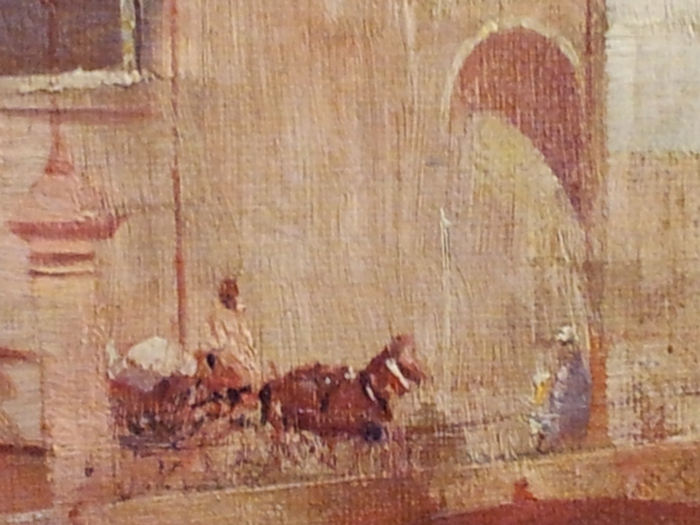 Below I’ve included a detail of the lower area of the painting, which more clearly shows the individual dots of pigment. In this instance the marks vary in size and are sometimes more short strokes than dots. The detail also shows the colour choice in an area of shadow. Looking closely it seems that some colours are used in both the shadowed and the brightly lit areas. One difference to most of Seurat’s work is that Pissarro’s has more movement and looks more lifelike. Here there isn’t that simplification and rounding of forms that at least in web images makes Seurat’s work look a bit stiff and eerily still. For examples of what I mean see A Sunday on La Grande Jatte — 1884 (www.artic.edu/aic/collections/artwork/27992) or Bridge at Courbevoie (www.artandarchitecture.org.uk/images/gallery/66b02bdc.html). This isn’t the first time I’ve read about Seurat and pointillism, having been asked to look at them as part of Assignment 3 in Textiles 1: A Creative Approach. My post of 13-Dec-2011 includes some brief comments about A Sunday on La Grande Jatte — 1884 by Itten (The art of color: the subjective experience and objective rationale of color) and John Gage (Colour in art). There are also some exercises using french knots as the “points” in colour mixing. In my review of that assignment on 16-Dec-2013 I quoted from Smee (Side by side: Picasso v Matisse), regarding Matisse’s experiments with divisionism and its problems with haziness and actual reduction of colours. This time around I’ve found some contemporary comment on Seurat’s work and its impact. I’ve chosen to include rather long quotes because of the very close involvement of the authors with Suerat. Camille Pissarro writing to Durand-Ruel, November 6, 1886, explained: “THEORY: Seek for the modern synthesis with scientifically based means which will be founded on the theory of colours discovered by M. Chevreul and in accordance with the experiments of Maxwell and the measurements of O. N. Rood. “Substitute optical mixture for the mixture of pigments. In other words: break down tones into their constituent elements because optical mixture creates much more intense light effects than the mixture of pigments” (Pissarro, 1886). A more extended explanation from Félix Fénéon, a critic who championed Seurat’s work: “M. Surat’s innovation has as its basis the scientific division of colour. It goes as follows: instead of mixing the colours on the palette, with the end product, when spread on the canvas, providing roughly the colour of the object to be represented, the painter will cover the canvas with separate touches corresponding, some to the local colour of that object, others to the quality of the light falling upon it, yet others to the reflections cast by neighbouring bodies, others still to the complementarities of the surrounding colours. “These touches are effected not by the thrust of the paint-brush, but by the application of a scattering of lesser spots of colour. “1. The colours are composed on the retina. We thus have an optical mixing. Now the intensity of the light of the optical mixing (mixing of colour and light) is far greater than that of the pigmentary mixing (mixing of colours and materials). This is what modern physics expresses when it tells us that all mixing of colours on the palette is a journey towards blackness. “2. This mixing on the retina imparts a luminous vibrancy which gives the picture great vitality. “3. The relief which cannot be translated precisely through the trails of paste of the traditional method, is achieved in all its infinite delicacy, since the respective proportions of the particles of colour can vary infinitely over a very small space. Finally, Pissarro describing his disillusion in a letter to Henri Van de Velde: “Having tried this theory [divisionism] for four years and having now abandoned it, not without painful and obstinate struggles to regain what I had lost and not to lose what I had learned, I can no longer consider myself one of the neo-impressionists who abandon movement and life for a diametrically opposed aesthetic which, perhaps, is the right thing for the man with the right temperament but is not right for me, anxious as I am to avoid all narrow, so-called scientific theories. Having found after many attempts (I speak for myself), having found that it was impossible to be true to my sensations and consequently to render life and movement, impossible to be faithful to the so random and so admirable effects of nature, impossible to give an individual character to my drawing, I had to give up. And none too soon!” (Pissarro, 1896). As to the question of any link to Seurat’s more working class subject matter, it’s not obvious to me that his subject matter was hugely different to the Impressionists. Is a circus by Seurat more working class than the Folies-Bergères by Manet? Seurat’s Bridge at Courbevoie (www.artandarchitecture.org.uk/images/gallery/66b02bdc.html) seems to show a factory in the background. 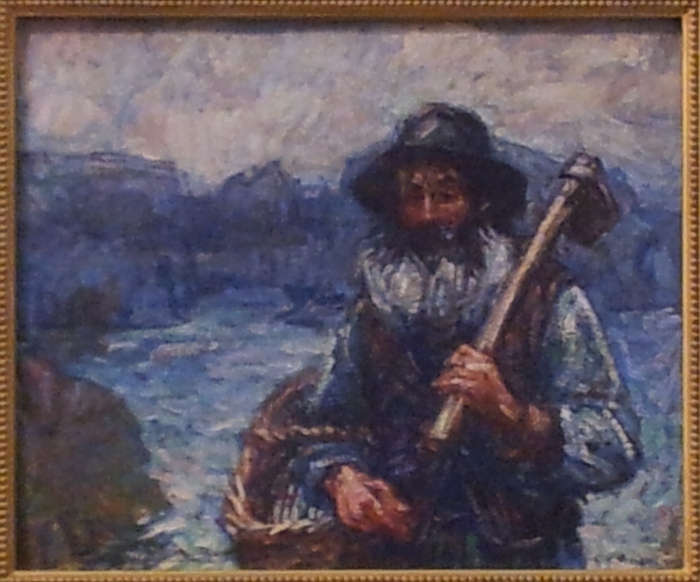 Is this more working class than Monet’s Coalmen (http://www.musee-orsay.fr/en/collections/works-in-focus/search/commentaire/commentaire_id/les-charbonniers-349.html?no_cache=1), or even John Peter Russell’s fisherman (see 11-Nov-2013)? To support that this is not simply my limited knowledge of the oeuvre of the various artists, I found on The National Gallery (London) website: “Modern life and the way that ordinary people spent their free time were popular subjects with many Impressionist painters. “Monet, Renoir and Degas show us the theatres, cafés, and popular countryside resorts of late 19th-century Paris. Putting that question to one side, a potential link to working class values and aspirations may be seen in Seurat’s political views – or at least the views of others who experimented with or championed his techniques. An article by Stephen Eisenman in 1989 provides more information. Eisenman quotes Signac writing in an anarchist journal “By the synthetic representation of the pleasures of decadence – balls, chacuts (cancans), circuses, such as those done by the painter Seurat who had such a vivid perception of the degeneration of our transitional era – they will bear witness to the great social trial that is taking place between workers and Capital” (Signac, 1891). To me this doesn’t confirm that Seurat’s subject matter was directly working class, rather that his overall purpose or theme, at least in part, was supportive of the working class struggle. 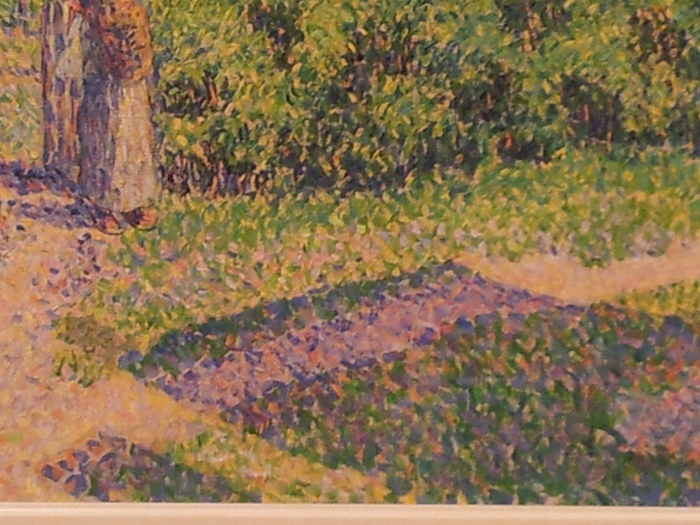 Going more closely to the question of Seurat’s technique, Eisenman suggests Signac believed that “stylistically innovative art, by its very freedom from convention, was necessarily revolutionizing” (Eisenman, 1989, p. 213). It was not simply that Seurat’s technique was innovative, it actually changed the relationship between artist and audience. Eisenman explains “rather the question [of Seurat’s politics] is whether a given work by Seurat initiates a political and aesthetic dialogue with its spectators, thereby encouraging them to realize their capacities for critical thought and aesthetic pleasure…” (Eisenman, 1989, p. 214) He continues “[Grand Jatte’s] Chromo-luminarism demands the collaboration of its audience, thereby positing the revolutionary ideal of overcoming the alienation of artistic producers from consumers within capitalist society”. The spectator is collaborating, an active participant, and this aesthetic pleasure is available to anyone regardless to class or education. * an explanation of the misunderstanding of the science underlying Seurat’s theory: Lee, A (1987) ‘SEURAT AND SCIENCE’, Art History, 10 (2), pp. 203-224, Academic Search Alumni Edition, EBSCOhost, viewed 12 November 2013. * Chevreul, one of the commonly mentioned sources influencing Seurat, was a chemist who became interested in colour as Director of Dyes at the Gobelins where he was responsible for the dyeing of wools for tapestries. Nice to have the textile connection, but I’d suggest a more useful book that ventures into science and Pointillism but also yarn structure and loom-weaving is Lambert, P. et al (1986) Color and Fiber. West Chester: Schiffer. * As well as his techniques in applying colour to the canvas, Seurat experimented with expressing emotion through lines and colours. This was based on the work of Charles Henry, a French physicist. I have seen only brief mention of this – it would be interesting to learn more. * There seems to be a lot written about the science and the politics of Seurat’s work. It was refreshing to read an article reminding us to see the art. Kramer, H. (1991) “Seurat, one hundred years later” The New Criterion. 9 June 1991. p.4. [online] Available from http://www.newcriterion.com/articles.cfm/Seurat–one-hundred-years-later-5498. Accessed 13-November-2013. The search for appropriate pictures for this exercise has overtaken the exercise itself. “Choose two Impressionist images that most people would recognise – the sort of images that appear on calendars and souvenirs in museum shops. Are these simply attractive images or do they tell you something more about contemporary life, especially city life?” is how the requirements begin. Manet’s Bar at the Folies-Bergères is suggested and the actual illustration in the notes is Renior’s Ball at the Moulin de la Galette. The Manet painting is at The Courtauld Gallery in London – http://www.courtauld.ac.uk/gallery/collections/paintings/imppostimp/manet.shtml. The Renoir is in the Musée d’Orsay in Paris (link). I’ve been working hard in this course to select works that I could see in person. There are beginning to be some wonderfully detailed photographs of artwork available on the internet, but it’s just not the same. I haven’t been able to locate any paintings by Manet or Renior on public view in Sydney (the NSW Art Gallery (AGNSW) has a couple of prints). I’m going to spend a few days at the National Gallery of Australia (NGA) in Canberra soon – where they have some prints. The NGA and AGNSW both have works by other French Impressionists, but none involving city life and I’d suggest none of the stature of the works suggested by OCA. Time to step back and reconsider the question. The textbook and the course consider only French painters in the discussion on Impressionism, apart from a fleeting mention of Whistler in the discussion of Japonisme. Why? Is it simply a matter of space, to enable a clean, logical progression in presenting a condensed History of Art? Was there something extraordinary happening, somehow self-limited to national boundaries? Is it convention and convenience? A form of snobbery? A quick search found a page on American Impressionism on the Metropolitan Museum of Art website (http://www.metmuseum.org/toah/hd/aimp/hd_aimp.htm). The essay included there suggests that initially, in the 1870s, most American painters in Paris were repelled by the impressionist innovations. Gradually as impressionism “lost its radical edge” it attracted more and more American painters and collectors (Weinberg, 2004). The images used to illustrate the article include works painted in France and in America. Closer to home, it has been written that “The Impressionist Movement did not reach Australia in its pure form… To investigate the school of Australian Impressionism, is to investigate what happens to a technical method and approach to painting – and Impressionism was no less – evolved in one country, when it comes in contact with a new environment and another set of social conditions” (Smith, 1945). Could any of these Australian works fit the exercise brief? Are they derivative rather than innovative? Is the “impressionism” a surface decorative style rather than a more substantial understanding of the same concerns? If as suggested by the assignment question impressionist paintings “tell you something more about contemporary life, especially city life”, what could that mean in an Australian context? What are some characteristics of (French) Impressionism? * subjects landscapes or contemporary middle-class life (not the historical, mythological or narrative themes of the past). * painted what was in front of them – invent nothing, although showing the perception, individuality and sincerity of the artist. 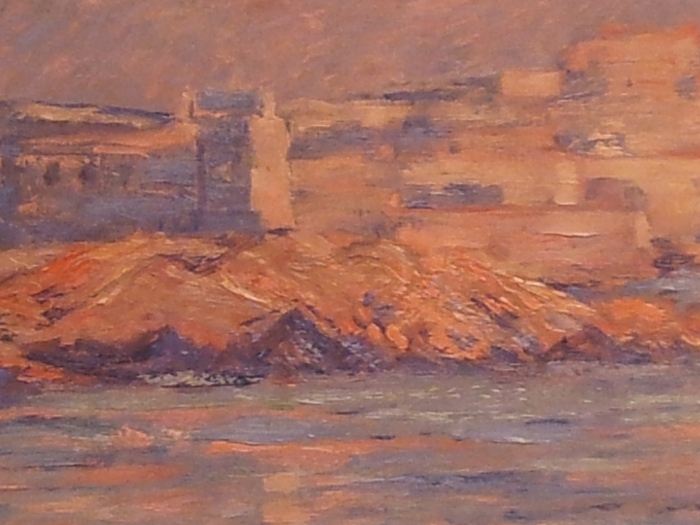 * for Monet, “light and atmosphere are the subject” (Honour and Fleming, p. 704). * varied, looser brushwork – broken lines and patches of colour, rough handling, uneven thickness, using the end of the brush… (not the high finish of academic work). * pure spectrum colours, not mixed on the palette. * absorbing influence of “alien” cultures, especially Japanese prints. There isn’t a definitive list or “look”. There was a lot of variation between different artists, and in the work of a single artist over time. There are contradictions within the list (for example objective, but through the senses of the artist), and in practical application. There was a desire to capture “the truth of the first immediate impression” (Honour and Fleming, p. 703), but while some of Monet’s works were painted in a single sitting, in many he elaborated the surface over multiple sessions, densely working some areas, layering brushstrokes, editing and refining (see Shackelford, 2008). A final characteristic, which I’m only taking early steps in understanding: Monet was searching for a way to solve the “problem… of how to combine and reconcile pictorial three-dimensional illusionism with the flat painted surface as a field for invention” (Honour and Fleming, p. 713). In a talk on Manet’s A Bar at the Folies-Bergère Philip Pullman explains that in this period artists became interested in the nature of depictions itself – art was “self-conscious” and “the painted surface is as important as the subject”. Near the end of his talk Pullman posits that there is no progression in art. All great art has a “double character”, making a likeness of some kind and exploring the nature of making that image – how a pattern is created, or aerial perspective, or molding with shadows and highlights or the sensual pleasure of applying pigment (see Pullman, 2009). It seems that together with the checklist of characteristics above there is an extra something with the “original” (my word) Impressionists – something of innovation and exploration and risk-taking and integrity. Although I’ve decided to look locally for subjects for this exercise, Pullman’s talk is highly relevant to the original requirements. Manet’s work does show a lot about contemporary life (I’d never noticed those legs of the trapeze artist top left before). However Pullman shows that the oddities in the painting – the “reflection” that is ambiguous and when analysed doesn’t quite work – make the image more than a simple depiction of what was in front of the artist. It poses questions about the nature of reality – which is the real girl, what is the real transaction? After that long introduction, can I find available to view in Sydney works that at least roughly fits the brief of the exercise? (with standard apologies about the quality of my photographs). The Monet above doesn’t meet criteria of being particularly well known and urban. This painting by John Peter Russell also misses the same criteria. Even while rejecting it for this exercise, I’ve included it here because Russell is one link between (French) Impressionism and Australia. It has been suggested that “if we accept a rigorous definition of Impressionist style and colour, the only Australian who rightfully qualifies to be designated an Impressionist is John Russell” (Vaughn, 2007. p. 16). Russell met Vincent van Gogh at art school and maintained a correspondence with him until the latter’s death. Living for many years on Belle Ile in Brittany, Russell met Monet there and had the opportunity to watch him (Monet) at work (see Galbally, 2008). This next painting is by Tom Roberts, whose visit to Europe in the early 1880s included a painting trip with Russell and others to Spain. Back in Australia, Roberts was one of a small group of artists who deliberately set out to introduce Impressionism to local audiences with the 9 by 5 Impression Exhibition of 1889. In the context of this OCA exercise topic, it is important to note that the exhibition “reflected the artists’ awareness of international art and artists, and a desire for their work to be seen in that broader context” (National Gallery of Victoria, [n.d.]). This work of Robert’s from the previous year was included in the NGV Australia Australian Impressionism exhibition of 2007. 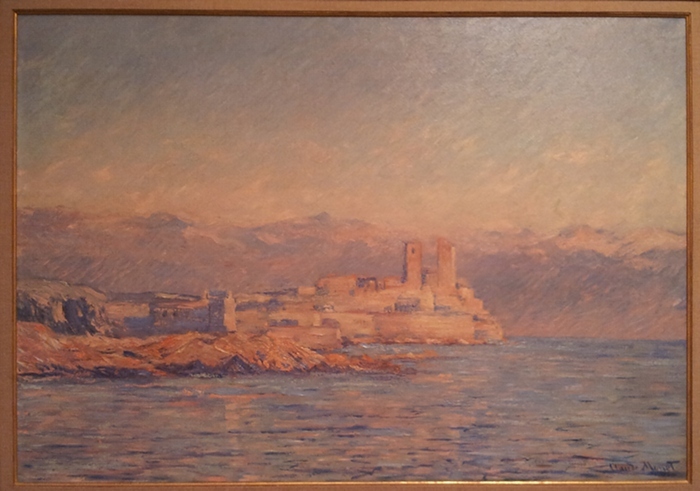 It doesn’t have the spectrum colour from list of characteristic above – admittedly the photograph doesn’t help, not picking up the touches of red throughout the painting, or the unifying coppery glow. Possibly this shows a stronger influence from Whistler’s works. It is an urban scene, and although not a interior filled with figures tells about the experience of an Australian city of the time. There is the bustling port, the smog of progress, more people to be found than you see at first glance, and that most distinctive part of Sydney, the waters of the harbour. The picture has been described as “a hymn of praise to the energy, enterprise and progress of the modern city” (Astbury, 1989. p. 34). 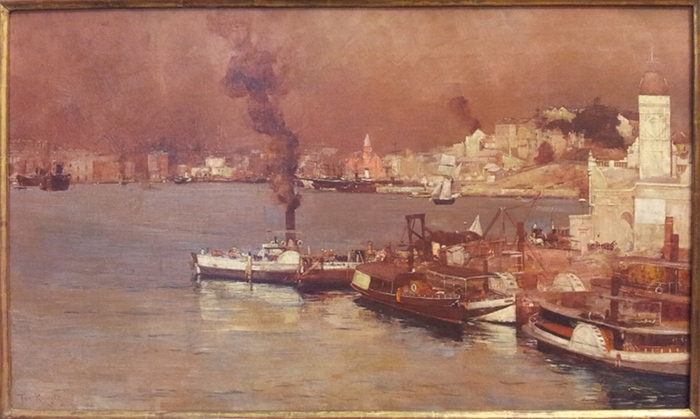 Another painting that I would like to show is actually in London at the moment at the moment at the Royal Academy of Arts – Departure of the Orient – Circular Quay by Charles Condor, another of the exhibitors in the 9 by 5 Impression Exhibition (http://www.artgallery.nsw.gov.au/collection/works/829/) (see http://www.royalacademy.org.uk/exhibitions/australia). Apart from being a personal favourite, this painting has a specific Australian flavour to its urban scene, showing a mail ship. 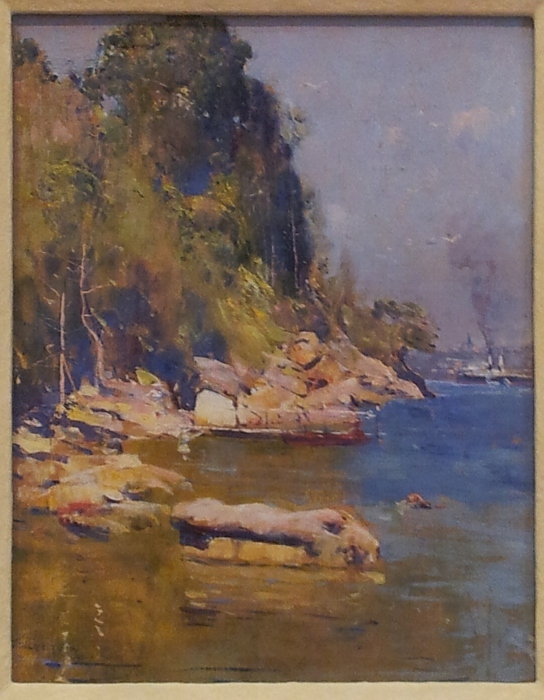 Arthur Streeton was the third major figure in the 9 by 5 Impression Exhibition. This scene seems to me more “impressionistic” than that of Robert’s above, in the sense of appearing spontaneous and immediate. It is also lighter-keyed, with some pure spectrum colour although overall more tonal. Astbury (1989, p. 124) suggests that “Streeton chose not to emphasise the movement and activity characteristic of the area but to concentrate instead on the play of light and atmosphere”, which links back to Monet’s focus in the list of characteristics above. 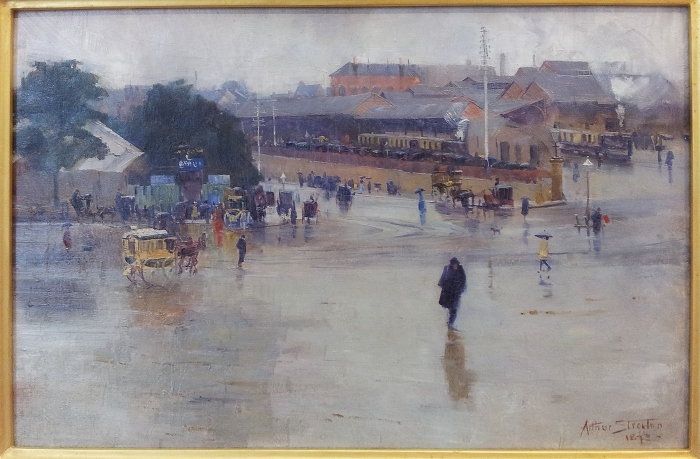 The signage at the NSW Art Gallery includes “Streeton’s choice of modern railway subject matter and his evocative approach were influenced by French and British impressionism as well as the decorative, asymmetrical design and flattened picture plane of Japanese woodcuts”. Looking closer I think this is a good example of an Australian approach mentioned by Vaughan: “The Australian painters saw themselves as Impressionists of tonal effects, often using a square-headed brush which produced sharp-edged areas of tonal colour, rather than adopting the fractured brushwork and extreme chromatic experimentation of mainstream French Impressionism” (Vaughan, 2007. p. 19). 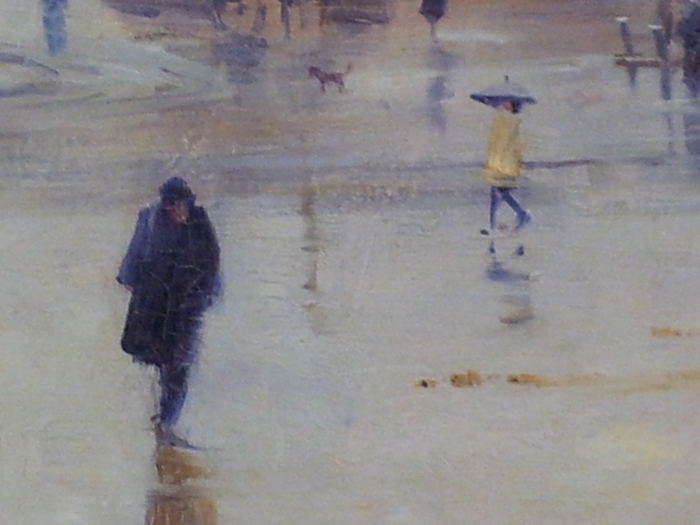 However although urban, I would say these works of Roberts, Condor and Streeton are not the “Australian impressionist” paintings that most people would recognise. 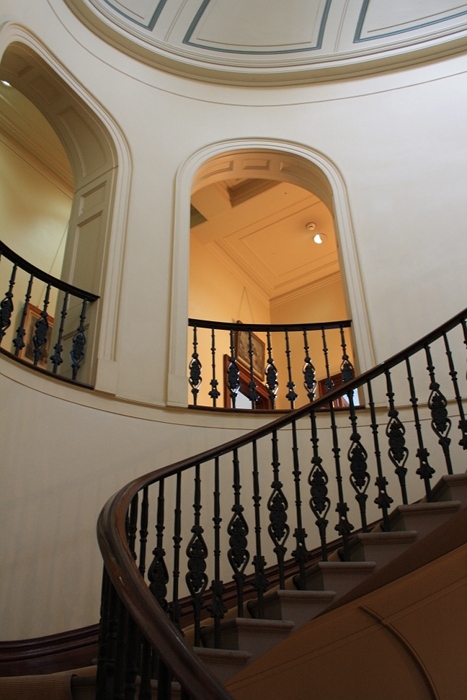 This is regarded by the Art Gallery NSW as a highlight of its collection. It was largely painted en plein air and is high-keyed. However it was not spontaneous nor contemporary. It was staged. A special platform was built to provide the high vantage point. The scene was based on an event that occurred 30 years earlier – history painting! The important thing is that it was Australian history, in an unmistakably Australian “tranquil, sun-drenched landscape” (Astbury, 1989, p. 124). 1888 was the centenary of white settlement in Australia. There was a surge of nationalist sentiment leading up to Federation 1st January 1901. One national characteristic was a level of larrikinism, irreverence towards the law and support for the underdog – making a stage hold up a sympathetic theme. 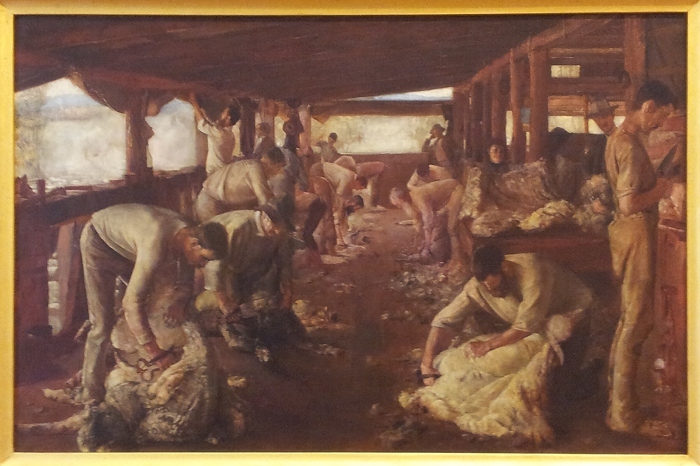 Another painting by Roberts, one of a series, celebrates rural life, mateship and the nobility of hard work. I particularly like this version because of the space given to the land outside, harsh but bountiful. “The bush” and “outback” are very important themes in the Australian identity, and in this period the “distinctive light and texture of the Australian bush” (Lane, 2007, p.14) was certainly celebrated by the Australian impressionists – but we are primarily an urban nation. A classic urban scene in Paris may be a questionable transaction in a nightclub. For me as a Sydney-sider the classic urban scene is a blue sky, some bush and sandstone, some buildings and boats, and the many colours of the harbour. For a time Streeton, Roberts and others set up a camp by the harbour in Sydney, living under canvas, commuting by boat, and apparently furnished with a piano. From my camp (Sirius Cove) for me fits the exercise brief of an impressionist painting that is very well known, an attractive image, and also tells more about contemporary life. The colour (follow the link to the Art Gallery site for a better version), the brushwork and the spontaneity are all there. In addition it shows the beauties of nature embedded in the city. Have I fulfilled the requirements of the course exercise? Certainly some of the Australian works shown above would be very familiar to Australian audiences and can be viewed as “a part of Australian cultural identity, the local equivalents of, say, … Renoir’s Moulin de la Galette…” (Hansen, 2007, p. 681). They all show many of the characteristics of Impressionist painting, albeit with variations. They also played a part in the emergence of a distinctive Australian voice and identity, and so, I suggest, entirely appropriate selections by an Australian student of the history of western art. Hansen, D. (2007) “National Naturalism” In Lane, T. (2007) Australian Impressionism. Melbourne: National Gallery of Victoria. Lane, T. (2007) Australian Impressionism. Melbourne: National Gallery of Victoria. Shackelford, GTM (2008) “Monet’s Technique” In Shackelford, GTM Monet and the Impressionists. Sydney: Art Gallery of NSW. Smith, B. (1945) Place, taste and tradition: A study of Australian art since 1788. Sydney : Ure Smith. 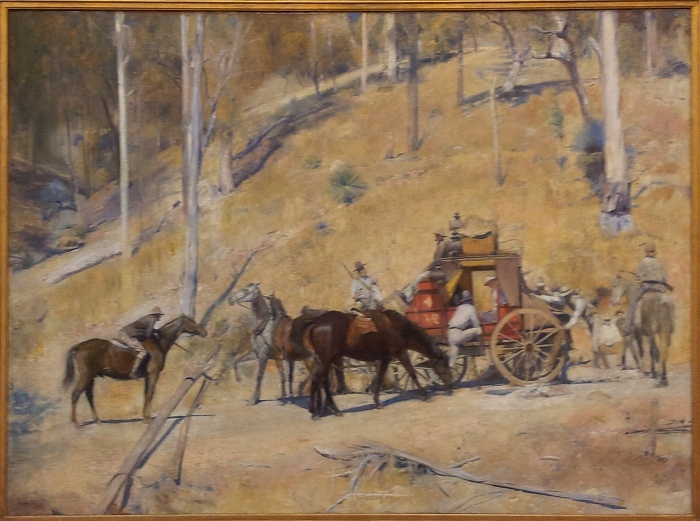 Cited in Lane, T. (2007) Australian Impressionism. Melbourne: National Gallery of Victoria (p. 18). Vaughn, G. (2007) “Some reflections on defining Australian Impressionism” In Lane, T. (2007) Australian Impressionism. 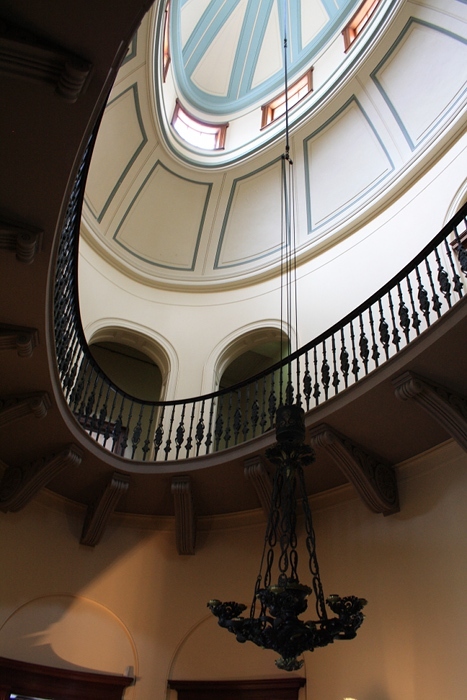 Melbourne: National Gallery of Victoria.